In this study, your students will zero in on two crucial books of the Bible in the journey from Genesis to Revelation. For 13 weeks, they will look at the history of the early church as recorded by Luke in Acts and Paul’s letter to the Christians in Rome. Click here to see 13-lesson overview (master plan). 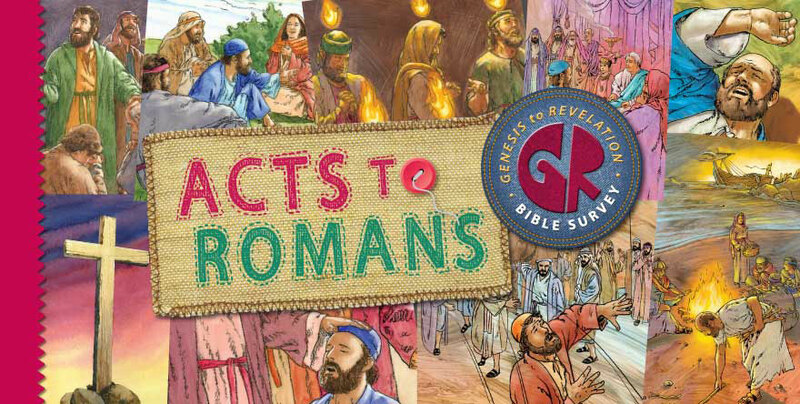 Preteens and young teens are familiar with many of the stories in Acts—the ascension of Jesus, the coming of the Holy Spirit at Pentecost, Peter’s witness, Stephen’s stoning, and Paul’s ministry. Now they will connect these events, focusing on God’s purpose in the early church, the role of the Holy Spirit, and how the gospel spread from Jerusalem to much of the Roman Empire. This overview will provide a great backdrop against which they can appreciate the New Testament letters. Moving on from Acts, students will then learn that Paul not only preached the gospel and started churches all over Asia and Europe, but also wrote letters to encourage, teach, and rebuke congregations and individuals. In Romans, Paul explained that an understanding of the great doctrines of God’s grace provides the foundation and motivation for Christian living. Wouldn’t it be amazing if your preteens/teens grasp the message of Romans by remembering these five truths? They will explore Paul’s convicting and encouraging letter using this structure of the 4 S’s and 1 J. Each lesson in this study also does something crucial for your students: It ties each event to God’s redemptive promise and plan to redeem a people for himself by sending the Messiah, Jesus Christ. The Bible is God’s story of salvation through Christ, who is the focal point of all Scripture. Also important to your kids’ spiritual growth is learning to have time alone with God and his Word. To help, we provide a weekly Devo paper that explores memory work as well as other Scriptures related to the lesson. Encourage your kids to set aside time to complete this paper, and ask them about it. You’ll also see another paper called G2R. It’s full of games and activities to get students excited about the world of the Bible and learning about Jesus. Each week, consider sending an overview of the lesson to the parents. It’s provided as a digital download (free with Teacher’s Kit purchase) and called Preparing Your Heart. As your parents and families learn more about God’s great story of redemption, they too will grow in trusting and worshiping him as Savior. Remember that this is a survey—an overview—not an in-depth study. Don’t get bogged down in the details of each lesson. Try to do a lesson a week to keep your students interested and growing. Ask questions at the beginning of each lesson to ascertain what they already know about the Scriptures you are covering, and then adapt the time to focus on those areas they don’t know or are less familiar with. Read the Getting Started Guide (pp. 8–12 in the Teacher’s Manual), and then each of the Preparing Your Heart sections to get a good overview of the scope of the 13 lessons. Then begin the exciting adventure of leading your students lesson by lesson through 1 Samuel to Esther. God’s Word is our “only rule of faith and practice” in which God himself tells us what to believe and how to live. The Holy Spirit is the One who enables us to be both hearers and doers of the Word. By God’s grace, the intent of these studies is that both you and your students will gain a deeper hunger and thirst for God in his Word, and a greater love for and trust in the Savior he promised and sent to reconcile us to himself, Jesus Christ.